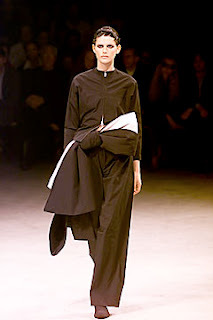 Yohju Yamamoto, b.1943 in Tokyo a fashion designer who creates a blend of traditional Japanese dress with Western day wear. He achieves a unique, abstract style, often loosely layered black with simple asymmetric design. I was introduced to his work in the V. & A. Museum in the 'Exhibition of Costume' in 2007 where they displayed the 'Summer Dress', Tokyo 1988-89. 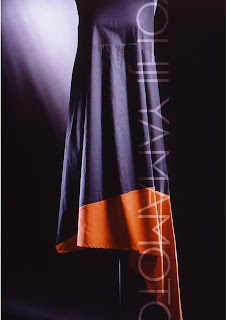 This dress was so simple, black with an asymmetric triangle of burn orange. The hem dipped almost to the ground on one side rising to an unusual cupped finish on the other. He often uses black, adding offset collars, non functional flaps and irregular hems, sometimes in white on the black ground, often capitalizing on the effects of light on matt and shiny black. "I always wear black or navy, my only concession to colour being a white shirt or T-shirt", (Sunday Times Magazine, 26th Feb. 1989). In his latest menswear collection, he shows asymmetric coloured shapes on the suits. 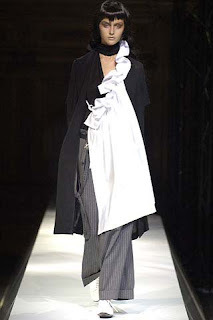 Often he will have uneven gown shoulder straps, hems and jacket lengths. Many have different cut lengths around a jacket or coat. As I am studying and experimenting with different blacks, I am interested to see that Yohju does the same. He presents his garments from pure black through to blues and soft dark greens and greys often showing black matt against shiny with one sided detail, sometimes white, also rust, scarlet blue or turquoise. Why do I find his work so interesting? I use similar colours but also I find the aesthetic of his work comes from a deeper level than the pure visual. This is the way of being of the Japanese culture. If it doesn't mean something to them, if it doesn't touch their souls, then it is not worth doing.